In this innovative design Shay Alkalay challenges our perception of what a drawer unit can be. Individual, multicoloured, ‘ floating’ drawer units are built up creating a tower of drawers that can be pushed and pulled in both directions. This will often result in a random and irregular composition that is both fascinating and unusual to the eye. 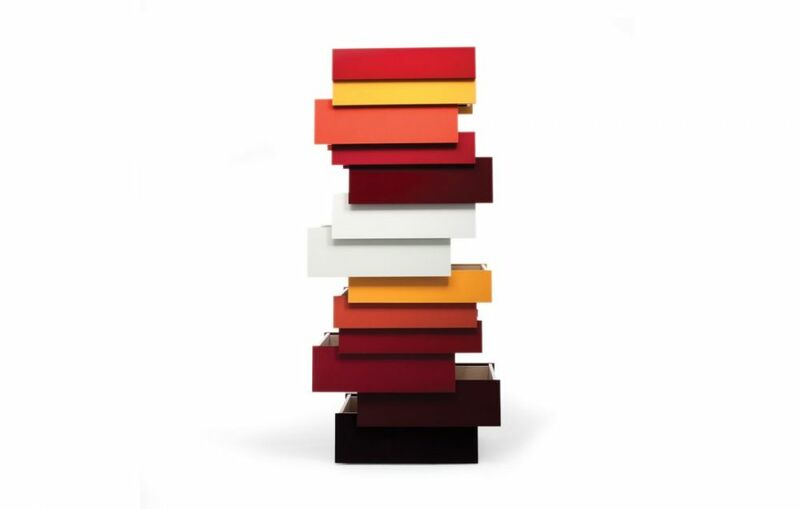 Appreciated from all angles as a sculptural object as well as an entirely functional, practical item of furniture, Stack creates a rich and wonderful spectacle of colour and form. Note: Quick Ship lead times are not guaranteed for order quantities above 5. For larger orders, please contact your Clippings sales representative to determine accurate lead times and live stock levels. After graduating with an MA in Product Design from the Royal College of Art, Shay Alkalay and Yael Mer set up Raw Edges, a London based design studio. This official collaboration between Yael Mer & Shay Alkalay started after many years of sharing life, thoughts and ideas. Yael’s main focus includes turning twodimensional sheet materials into curvaceous functional forms, whereas Shay is fascinated by how things move, function and react. Alkalay and Mer have received several highly respected awards including The British Council Talented Award, iF, Wallpaper* Design Award 2009, Elle Decoration International Design Award in 2009 and the 2009 Designer of the Future Award from Design Miami/ Basel. Alkalay’s Stack is included in the Museum of Modern Art, USA permanent collection. Established & Sons is a uniquely positioned British design company focused on producing and representing all that is innovative in contemporary design.